Posture refers to the position in which an animal holds its body in order to support its weight and withstand the forces to which it is subjected, and thus is an important element in all forms of animal locomotion. On land, terrestrial mammals support their bodyweight on legs, while gliding or flying mammals use wings to support the body in the air. In aquatic mammals the weight of the body is supported by the water, but posture remains important in maintaining buoyancy and balance. The support of water gives aquatic mammals the opportunity to become very large. The heaviest living land animal is the African elephant (~10 tons). Some extinct land dwellers were larger – for example Paraceratherium, a hornless rhinoceros (~15-20 tons), and the huge dinosaur Dreadnoughtus is estimated to have weighed about (~40 tons). But even these giants are dwarfed by the blue whale, whose ~100 ton bulk might be possible only in water (ref.3, ref.4). The same materials, bone, muscle, tendon, and skin, are used to support the body and produce movements in all mammals. The way these materials are deployed reflects the body weight that has to be supported. The form of weight-bearing bones can be illuminating. For example the thigh bones of heavy mammals are straight, circular in cross section and have bellied bone-ends that fit into hip and knee joints. The bones of lightweight mammals tend to be curved, with oval or triangular cross-sections, a structure that may help direct forces to best effect as the animal moves (Fig. 5, ref.5,ref.6). The configurations of bone also reflect body weight. Heavy terrestrial mammals (e.g. 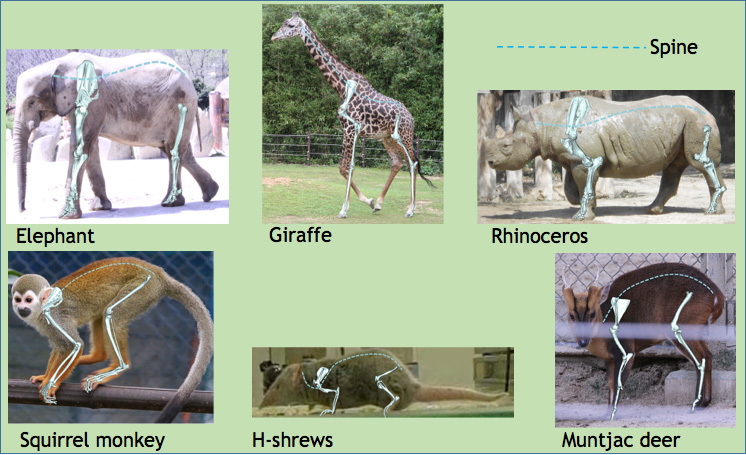 elephant, giraffe, rhinoceros) support the body with their pillar-like legs and spine extended, while smaller species such as squirrel monkey, H-shrews, and muntjac deer typically exhibit a flexed spine and/or limbs, suited to performing quick movements (Fig. 6). Fig . 5 CT images of the femur (though bone) of two heavy walking mammals (elephant and hippopotamus) and two sprinters (cheetah and blackbuck). 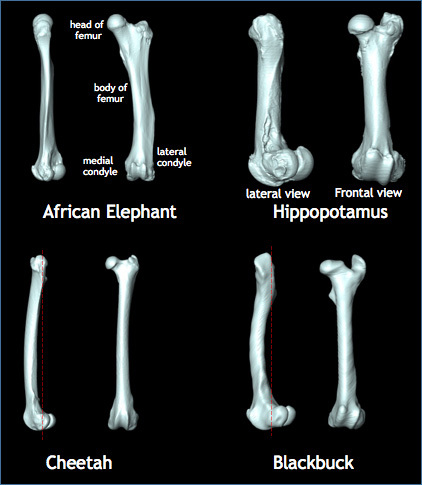 Note the thickness of the bone, and the greater curvature in those of the fast running species. Fig . 6 The configurations of bone of heavy terrestrial mammals and smaller. The heaviest terrestrial animal on Earth is the African elephant, males of which may weigh more than 10 tons (ref.2). The elephant body is characterized by a large head and ears, a large and flexible trunk, and long, pillar-like limbs, which support the body like the legs of a table. A table can be relatively sturdy and support a great weight even if the connection between the top panel and the legs is relatively loose. It could be considered that the same is true of the elephant – the pelvic and pectoral girdles do not need to be supported with large blocks of muscle, as long as the legs remain extended and the body axis remains more or less horizontal. Fig . 7 The elephant maintains its table-like posture when walking (A: lateral walk: please refer to Fig.10 of the section of Locomotion), keeping the legs extended beneath its body(B). The harvest mouse is the one of the smallest mammals, typically weighing about five grams (ref.1,ref.2). Harvest mice live among the stalks of grasses and other low vegetation and climb up and down (Fig.8) slender stems and leaves, aided by a prehensile tail, which is able to support the body weight. The posture of this tiny rodent is typical of small mammals from many different groups, and characterized by a curving spine and flexed limb joints, which allow it to launch very quickly into action (Fig.8). Fig . 8 The skeleton of Harvest mouse.